In Latin America and the Caribbean, the combination of natural hazards - earthquakes, floods, volcanic eruptions and others - and highly vulnerable conditions all too often cause severe damage to water and sanitation systems. Although many countries already have developed emergency plans to respond to these situations, recent disasters such as hurricanes Georges and Mitch (1998), the Venezuela rainstorms and floods of 1999, or the El Salvador earthquakes of 2001 have taught a bitter lesson - it is not enough to have emergency plans; there must be certainty that such plans will work, and this will only happen if they were based on the specific vulnerabilities of the systems in question. 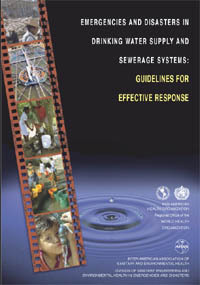 This joint publication of the Pan American Health Organization (PAHO) and the International Division for Health in Emergencies and Disasters (DIEDE) of the Inter American Association of Sanitary and Environmental Engineering (AIDIS) is a practical handbook for designing emergency and disaster response plans for water and sanitation systems based on detailed knowledge of existing hazards and vulnerabilities. The book revises and supersedes previous technical documents by PAHO and is an essential complement to Natural Disaster Mitigation in Drinking Water and Sewerage Systems - Guidelines for Vulnerability Analysis, published by PAHO in 1998.